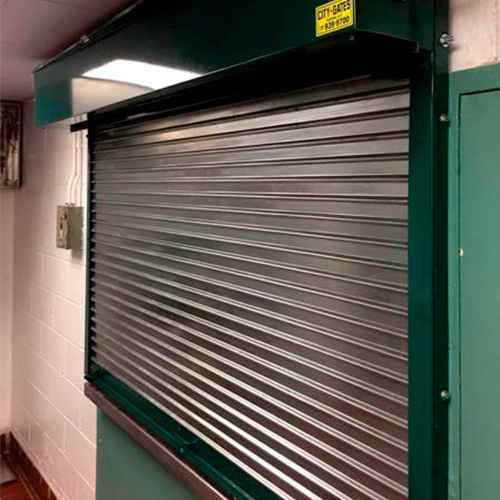 Counter Fire Shutters are designed specifically for pass-thru openings requiring fire protection. These units, with clean-line styling and compact dimensions, are proportioned for small counter openings. U.L. 3-hour labels are affixed to all units, for installation on interior fire walls. 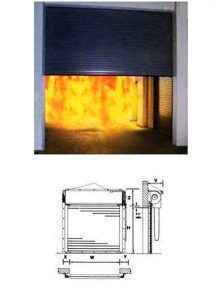 In case of fire, the fusible link releases the mechanism and the curtain descends automatically. Normally, the unit is used as a push-up operated counter shutter. clear opening area not to exceed 120 sq. ft.
Construct all components to conform to requirements of U.L., Inc., and apply class A 3-hour label. Push-up operation during normal usage. 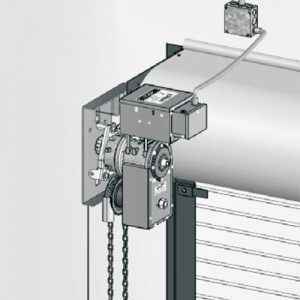 Automatic self-closing to be thermally controlled by release of the fusible link. (Crank or motor available). 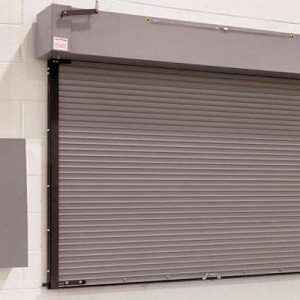 Interlocking roll-formed slats of (galvanized steel) (stainless steel), #22 Gauge, assembled with continuous endlocks. Matching bottom bar with slide bolts. Helical torsion springs with a 25% safely factor, mounted on a continuous torsion rod and housed in a steel pipe shaft. Shaft to rotate in sealed ball bearings supported by steel brackets. To be formed of 11 Ga. (steel) (stainless steel), with expansion slots on all connections spaced 12″ on centers. Minimum #24 Gauge (galvanized steel) (stainless steel). Ferrous surfaces and galv. steel slats with prime coat. Exposed stainless steel in 2B mill finish. Note: Apton and the American Rolling Door Institute support periodic inspection of all fire door assemblies. Provide fusible links for both sides of wall to allow thermal release from either side. Supply (magnetic) (electro-thermal) release that will activate the closing mechanism in addition to thermal release. Wiring to be by others. Provide (ionization) (photo-electric) smoke detector in conjunction with release. Stainless steel to be #4 satin finish.